Construction continues on the Chickamauga Dam Lock on Wednesday, Feb. 28, 2018, in Chattanooga, Tenn. The Inland Waterways Users Council took a tour of the lock. 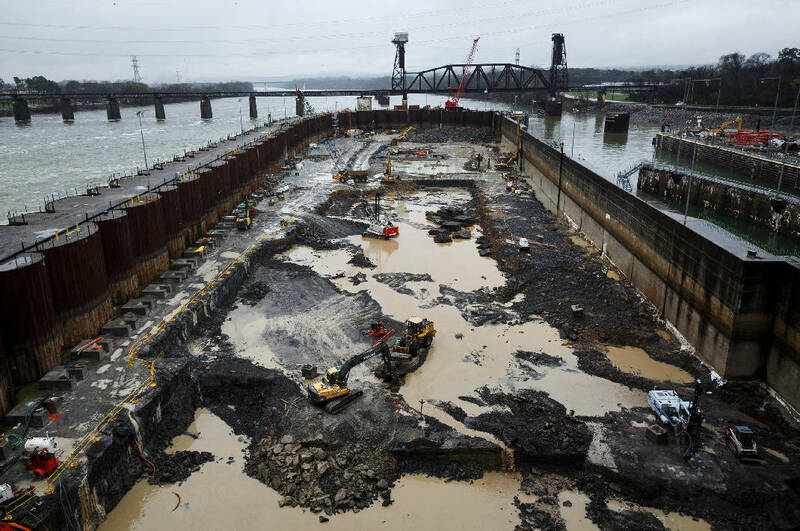 Come hell or high water, the barge industry continues to push for completion of a new Chickamauga lock to replace the crumbling 78-year-old lock that has been a river passageway for 318 miles of navigation upstream of Chattanooga. As the rain-swollen Tennessee River poured nearly 40 million gallons of water a minute through the Chickamauga Dam Wednesday, excavators, earth haulers and drillers continued to blast and dig into the riverbed below the dam where the new lock will be built. Within the walls of the coffer dam erected to house the new and bigger lock at the Chickamauga Dam, Heeter Geotechnical Construction is removing up to 35 feet of riverbed rock to help anchor the new 110-foot by 600-foot Chickamauga Lock. The Army Corps of Engineers, which is building the new lock, has spent more than $200 million over the past 11 years to design and start building the new lock. But as work has been delayed by budget shortfalls over the past decade, the cost of the new lock has more than doubled to $850 million. With rising costs and stagnant or declining commodity shipments through the lock, the benefit-to-cost ratio required for funding of the project under federal Office of Management and Budget guidelines is no longer sufficient to gain White House support for more funding. "Once again, we've got to go to the Congress and work to continue funding to get this project finished," Cline Jones, executive director of the Tennessee River Valley Association, said Wednesday during a tour of the ongoing work at the Chickamauga lock. "This is a critical project for commerce in our region and we've already invested so much it just makes sense to get it done." The barge industry, which moves more than $300 billion of bulk freight a year on America's inland rivers, was pushing the Trump administration to include lock, dam and other river improvement projects in the president's infrastructure program. But the fiscal 2019 budget proposes a 22.2 percent cut to the Army Corps of Engineers and the $1.5 trillion infrastructure program unveiled by President Trump earlier this year proposes turning over operations of some locks to private, third party operators to help raise more money and operate the lock maintenance more efficiently. "If the president wants to do harm to this industry, his budget request and his infrastructure plan is a fine way to do it," said Martin Hettel, vice president of government affairs for American Commercial Barge Line and chairman of the Inland Waterways User Board. The White House budget proposal could lead to another $178 million in vessel fees on barge operators and use some of the money in the Inland Waterways Trust Fund for operations and maintenance of locks, not just capital projects as the fund has historically been used. Hettel said shipping goods on the river can the cheapest, more environmentally responsible way to move heavy and bulk items. But to do so requires the United States to maintain and upgrade its network of 219 locks on its inland waterways. Hettel said it is unfair to assess so much of the costs of dams and locks on barge owners since recreational boaters, lakefront owners, farmers who irrigate and other water users also benefit. The new and bigger lock at Chickamauga would allow a tow boat to move nine barges through the dam at one time, rather than having to split up a barge tow and taking a half day or more to move a number of barges through the existing, smaller lock one at a time. Hettel said the cost of building new locks such as the Chickamauga and Kentucky locks on the Tennessee River have more than doubled since they were proposed more than a decade ago because the locks are not consistently funded by Congress to ensure the projects are built quicker and in a more cost-efficient manner. "We need Congress to get back to an annual appropriation process and quit limping along on continuous resolutions," Hettel said. The delay in adopting a fiscal 2018 budget has meant that only the Olmsted Locks and Dam project on the Ohio River has been funded so far this year. The Inland Waterways Users Council, an industry advisory board that helps the Corps of Engineers set its priority and will meet in Chattanooga today, has identified the new Chickamauga Lock as the fourth highest funding priority for inland water projects in the nation, behind only Olmsted, the Lower Monongahela River in Pennsylvania and the Kentucky Lock in Kentucky. Chickamauga Lock Project Manager Adam Walker said contractors are continuing to work on a $33.5 million lock excavation contract at Chickamauga that was awarded in September 2016. But there is so far no additional funding to continue to work after the excavation is completed. The Corps is also spending about $3.5 million from its operating budget to install new gate anchors and other fixes to shore up the upper gates on the existing Chickamauga Lock, which suffers from problems with "concrete growth" in the rock aggregate used to erect the lock when TVA built the facility in the 1930s. Contact Dave Flessner at dflessner@timesfreepress.com or at 757-6340.